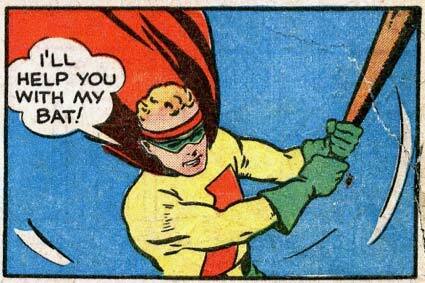 Shouldn’t that be “I’ll help you with my bat, biatch”? Or is he just channeling the ghost of Al Capone? No Skippy, this doesn’t make you “Bat Man”! It’s his ginger locks that ruin the look. No hero ever looked bold and dashing with red curls atop his noggin.